If you’re looking to get married on the beach this year or next you’ll want a dress that’s ready to be blown in the wind and maybe even handle some surf. Whether you buy a short dress or long dress there are plenty of styles that are perfect for the beach. With these tips you’ll not only find a dress that’s perfect for the beach, but make you look like a million dollars on your big day. Unfortunately a ball gown style dress might be out of the question, if you plan on bringing the dress on an airplane, some airlines charge extra for stowing it under the plane. The best thing to do is to ship your dress to your resort or hotel before you arrive. Mermaid style dresses are gorgeous and offer a nautical feel to your wedding. You’ll feel like the little mermaid when you walk down the beach towards your prince. The modified A-line isn’t as flowy as the A-line, but the length and skirt can still feel royal. These were very popular last year, some brides doing a 20’s style for their bridal look. A trumpet style dress is another choice that fits close to the body. This style is similar to the mermaid and is another gorgeous beach look. Lastly, the Tea length and mini are perfect for hot wedding destinations. These sit at the knee or above it and offer a fun and flirty look for your beach wedding. Not to mention you wont feel stifled in these dresses on a hot day. 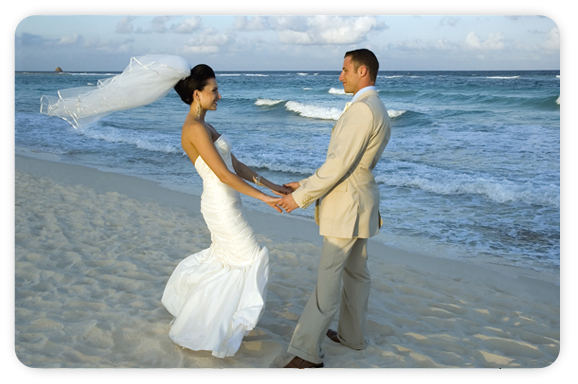 No matter which dress you choose, you’ll look fabulous walking through the sand toward you future husband.